the Supreme People’s Court (Court) opening discussion on the relationship among the legal institutions. What I mean by “Political-Legal Committees ‘coming out'” is that from the central level on down, Political Legal Committees now have their own websites that link to the institutions (with the exception of state security) at the same level of government. At the top level is Chinapeace, featuring articles related to Party policy (and other topics) in the legal institutions and linking horizontally to the websites of those institutions and vertically (downwards) to the local political legal committees. Chinapeace has links to the websites of local political-legal committees at the provincial level (or equivalent)–such as the Shanghai website. The Communist Party must have issued a decision to permit these websites to be established. It means that the Communist Party has decided that the Political Legal Committees need to be on the Internet to promote the Party’s policies. For the veteran observers of the Chinese legal system, it is an amazing phenomenon, when for many years, these committees had been in the metaphorical closet. The Constitution (Article 135) sets out the basic principle–they shall “in handling criminal cases, divide their functions, each taking responsibility for its own work, and they shall coordinate their efforts and check each other to ensure the correct and effective enforcement of law” . It is signficant that the Court has raised this, especially publicly. It is another issue for all concerned about the Chinese legal system to watch. Current plans for the new Shanghai Free Trade Zone (Shanghai FTZ) include reforms to China’s dispute resolution systems, both the courts and commercial arbitration. Court reform developments, in particular, are moving rapidly. On 5 November, the establishment of a tribunal (自贸区法庭) in the Shanghai FTZ was announced, with Judge Luo Dongchuan, the head of the #4 civil division of the Supreme People’s Court (Court) in attendance, among others. It follows the announcement by the Court designating the Shanghai courts to be among the first in the country to implement certain judicial reforms. These reforms are linked to the Supreme People’s Court 2013 Judicial Reform Opinion (discussed in this blogpost). Professor Ding, Chairman of Legal Affairs Commission, Shanghai Municipal People’s Congress Standing Committee, identified some of the reforms contemplated as well as some of the obstacles to legal reform in the Shanghai FTZ. in a thoughtful speech given at the opening of the China (Shanghai) Pilot Free Trade Zone Court of Arbitration (affiliated with the Shanghai International Arbitration Center). Professor Ding highlighting to the Shanghai political and legal leadership that the Shanghai FTZ provides an unprecedented opportunity for Shanghai to build itself into an international arbitration center. moving more litigation procedure on-line. . The decisions of the tribunal will be considered decisions of the Pudong New Area People’s Court and appeals will be made to the #1 Municipal Intermediate People’s Court. providing a structure for the discussion of cases. The Shanghai courts have started to take the first steps by issuing regulations to address one of the many issues facing litigants in the Chinese courts, the refusal to take cases (http://www.chinacourt.org/article/detail/2013/11/id/1116965.shtml）. We can expect many more regulations to come. The reforms highlighted by the Court will be difficult to implement, particularly the reform of internal operating rules of the judiciary, because the PRC judiciary has operated according to those principles throughout its history (as many others inside and out of the Chinese judiciary and mainland China have pointed out (including this author)). Many of these reforms relate, indirectly, to the relationship of the courts and other government institutions, as well as the nature of Communist Party leadership of the courts. The Court announced that it has established standards and metrics to evaluate the effectiveness of the announced reforms. On the basis of those reforms, The Court will gradually roll out those reforms throughout the entire country. The announcement designating the Shanghai courts as one of the court designated to lead the way in judicial reforms indicates the importance of Shanghai and the Shanghai FTZ. The Court has put aside the scandal involving a group of senior judges of the Shanghai Higher People’s Court visiting prostitutes (that led the Supreme People’s Court to issue a statement that the judges had tarred the image of the nation’s judges and scarred judicial credibility (http://english.peopledaily.com.cn/90882/8356970.html)). Designating the Shanghai courts to take the lead in court reform presents a challenge to the Shanghai Higher People’s Court—can they establish a court that will earn the credibility of both domestic and foreign litigants through having competent judges who are able to put into practice ethical standards? The announcements related to the Shanghai FTZ tribunal indicate that the Shanghai court authorities are selecting well educated judges for the task. Among the challenges Professor Ding identified in building the Shanghai FTZ into an international arbitration center is challenges to the arbitral institution. One of those challenges is internationalization. Challenges to the arbitration institution—possible internationalization? In the September interview mentioned above, Lu Hongbing advocated that cooperation between foreign arbitration institutions and Shanghai based ones should be encouraged in the Shanghai FTZ. Should cooperation between foreign and Shanghai based arbitration mean allowing international arbitration institutions to establish offices in the Shanghai FTZ? If that is permitted, should foreign arbitration institutions be permitted to hold arbitrations (seated) in China? Enabling real cooperation between foreign arbitration institutions and Shanghai based ones will require profound analysis of and well-considered solutions to the complex of issues related to the Arbitration Law and Civil Procedure Law raised by the above questions. An additional outstanding issue that the Court will need to resolve is the issue of the validity and enforceability of arbitration clauses of the Shanghai Court of International Arbitration (and its predecessor, the CIETAC/Shanghai). A draft of a judicial opinion resolving the matter is said to be under consideration by the Supreme People’s Court. That also needs to be resolved if dispute resolution in the Shanghai FTZ (and all of Shanghai) is to serve the needs of disputing parties. The Court, Professor Ding Wei (and other Shanghai government legal specialists) and the legal advisers for the People’s Government of Pudong District (lead outside counsel is understood to be the Zhong Lun Law Firm) need to work on designing solutions to untangle the web of interconnected legal issues affecting the internationalization of arbitration. Given that multiple central government institutions will need to be involved with any solution, it is likely progress on real cooperation with foreign arbitration institutions can only occur over the long term. The Shanghai FTZ provides the Chinese government an opportunity to experiment with Chinese dispute resolution reforms, both in the courts and arbitration. The Court is taking steps in Shanghai to address the difficult legal and political issues that must be considered and resolved to make real progress. Many are “watching this space”, particularly after the establishment of the Shanghai FTZ tribunal. Few are aware that current plans for the new Shanghai Free Trade Zone (Shanghai FTZ) include reforms to China’s dispute resolution systems, both the courts and commercial arbitration. Court reform developments, in particular, are moving rapidly, because the Supreme People’s Court (the Court) has designated the Shanghai courts to be among the first in the country to implement certain judicial reforms (http://rmfyb.chinacourt.org/paper/html/2013-10/26/content_72024.htm?div=-1#). These reforms are linked to the Supreme People’s Court 2013 Judicial Reform Opinion (discussed in my 30 October blogpost) and announced on 29 October. Reforms in dispute resolution were highlighted by Professor Ding Wei, Chairman of Legal Affairs Commission, Shanghai Municipal People’s Congress Standing Committee (http://www.cietac-sh.org/English/ResourcesDetail.aspx?tid=39&aid=571&zt=3) , in a thoughtful speech given at the opening of the China (Shanghai) Pilot Free Trade Zone Court of Arbitration (affiliated with the Shanghai International Arbitration Center) on 22 October. Professor Ding identified some of the reforms contemplated as well as some of the obstacles to legal reform in the Shanghai FTZ. Professor Ding’s made a statement in his speech that “judicial arrangements (for the FTZ) relate to the organization and authority of matters stipulated by the Organizational Law of the People’s Courts, and local government cannot make changes” makes it clear that substantial court reform in the FTZ is not in the hands of the Shanghai government, but rather the central government. From its press announcement on 25 October (http://www.chinacourt.org/article/detail/2013/10/id/1113813.shtml), it is clear that the Court sees the opportunity presented by the dynamism of economic developments in Shanghai, including the Shanghai FTZ (although not mentioned). 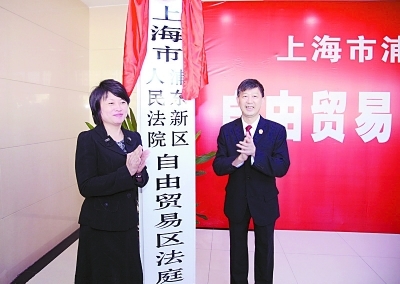 Although currently there is no Shanghai FTZ court ( Lu Hongbing, vice president of the All China Lawyers Association and founding partner of the Shanghai-based Grandall Law Group, mentioned in a September article the possibility that one will be established (http://stock.sohu.com/20130924/n387092295.shtml)), the Court is calling on the Shanghai courts to make reforms that will benefit litigants in the Shanghai FTZ (as well as the entire Shanghai court system. The Shanghai courts have started to take the first steps by issuing regulations to address one of the many issues facing litigants in the Chinese courts, the refusal to take cases (http://www.hshfy.sh.cn/shfy/gweb/xxnr.jsp?pa=aaWQ9MjkyMzQ0JnhoPTEPdcssz)(http://www.chinacourt.org/article/detail/2013/11/id/1116965.shtml）. We can expect many more regulations to come. Designating the Shanghai courts to take the lead in court reform presents a challenge to the Shanghai Higher People’s Court—can they establish a court that will earn the credibility of both domestic and foreign litigants through having competent judges who are able to put into practice ethical standards? The Shanghai FTZ provides the Chinese government an opportunity to experiment with Chinese dispute resolution reforms, both in the courts and arbitration. The Court is taking steps in Shanghai to address the difficult legal and political issues that must be considered and resolved to make real progress. Many are “watching this space”! [i] My translation: The translation on the website states: the justice arrangement concerning duty allocation among people’s court is an important power under the “PRC People’s Organization Law.” No local organizations are permitted to change it.